Every day it seems there’s another heartbreaking, horrifying, and mind-boggling development in the world. Sometimes it’s hard to wrap my head around what’s happening in our country. And I’m constantly asking what I can do about it. Somehow, I don’t think I’m alone in that feeling. Maybe we can find some answers together. 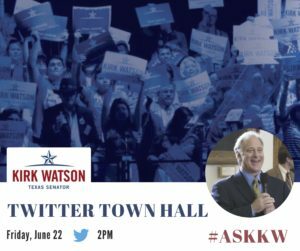 On Friday, I’ll be holding a “Twitter Town Hall Meeting” during the Texas Democratic Convention and would very much like for you to participate in the discussion. I’ve done this at previous conventions and find it to be a good way to connect with people. Dyana Limon-Mercado, the newly-elected chair of the Travis County Democratic Party, will be on hand to moderate. We’ll be taking questions via Twitter, so you don’t have to be in Cowtown at the convention in order to join the conversation. Tweet your thoughts and questions using the hashtag #AskKW and we’ll try to get to as many as we can over the hour. I hope we can get a good conversation going and would love for your to add your voice. I don’t have all the answers. But I do know that we need to continue questioning, looking for answers and moving together. We’re all in this together. We rely on one another. Let’s get together and talk about where we want to go.